International Bajrang Dal and Hindu Kranti Dal activists on Friday morning protested against the barbaric killing of Dhola incident in Dibrugarh. They also slammed the ULFA (I) militants for their involvement in the gruesome killing of innocent people. Normal life was paralyzed in Dibrugarh and Tinsukia didue to 12-hour bandh called by Bengali Yuba . All business establishment schools remained closed during the bandh. “We condemned the killing of innocent people and warned ULFA (I) to stop killing of innocent Hindu people. They were indigenous Hindu Bengali people living in the area for many years. They are a bunch of cowards killing innocent people. They have no guts to kill Bangladeshi Muslims,” said an activist. The ULFA (I), however, has denied the outfit’s involvement in the incident. They shouted slogan against the Sarbananda Sonowal led BJP government for its alleged failure to provide security to the common people. 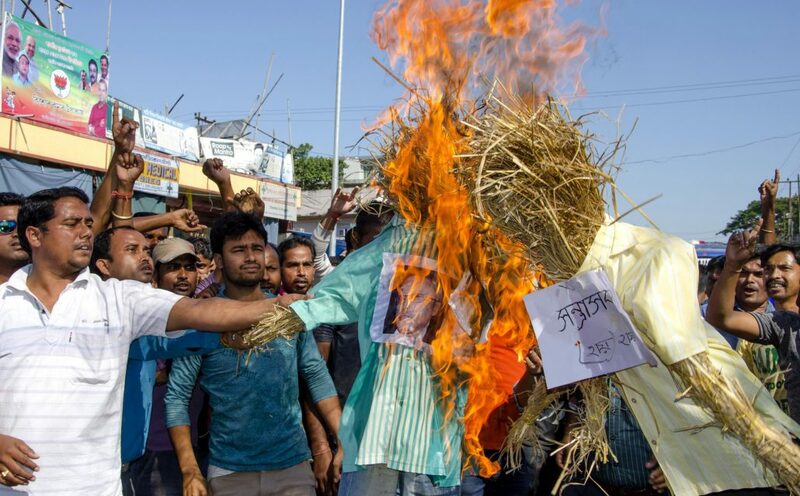 The Bengali organisation has called for 24- hours Assam bandh on Saturday aganist the killing of five innocent people.